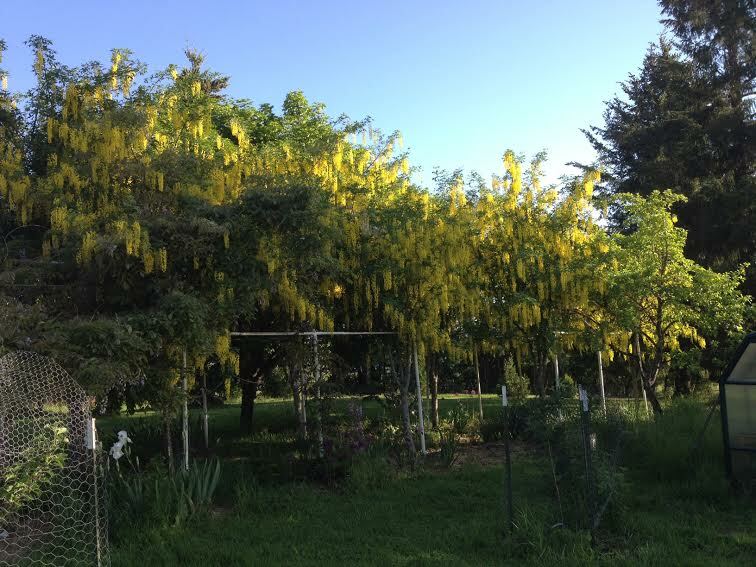 Our line of gold chain trees about 8:00 AM on a beautiful May morning. It has been a busy but beautiful spring, hence the light posting of late! But we had a couple of momentous events in the past week which have propelled us forward to the point where we almost feel as though we are now up and running like a well-oiled machine. 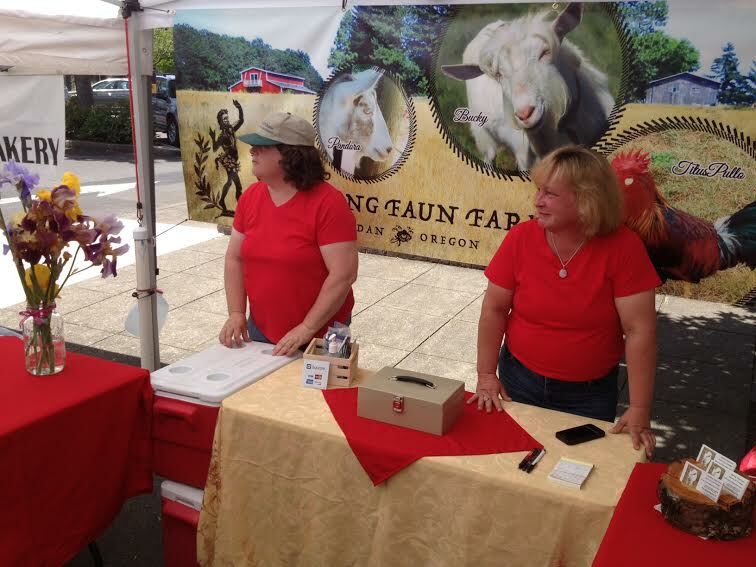 First, a week or so ago we started at our first market in Mac, where we are vendors at the McMinnville Farmers Market. 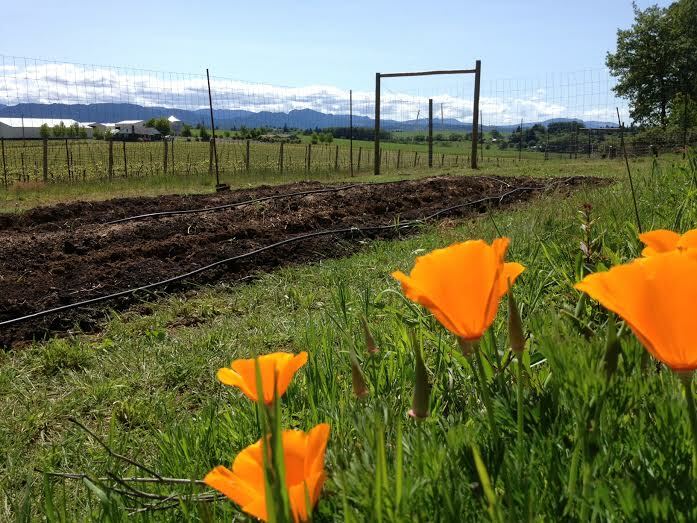 We have a prime place between our friends Aren and Beth at Yamhill River Farm, and the Carlton Bakery. Both are outstanding vendors, and the Carlton Bakery sells killer breads and pastries, including a wonderful crusty Pinot Noir-Cheese-Pepper roll that needs nothing on it and melts in your mouth! It is going to be a rough summer resisting an overdose of carbs with them as neighbors. Lori and Nancy tend our both on the first, very hot, day of market. We are the only poultry vendor at the market, and the only one to focus on eggs as well. In addition we are offering subscription hog shares and turkeys for the holidays. We had outstanding traffic and pretty vigorous sales at our first market, and learned a good bit about marketing in the process; we also met a lot of great people who are obviously very concerned about where their food comes from and how it is produced, which is great because that’s one of the key reasons we undertook this venture. People asked about how we kept our animals, about what we fed them, and about how we processed them. Given that pigs are dying in this country by the truckload due to the outbreak of a serious virus, people seemed particularly interested in the possibility of hog shares. What can I say – our pork, as noted in the previous post, is outstanding, and does not disappoint. In fact, every meal we have had with it has elicited embarrassing moans of pleasure that verge on a When Harry Met Sally moment. And it’s not just the meat: potatoes sautéed in our lard and butter with a sprinkling of chive or one of our chickens fried in lard with a dollop of bacon grease have turned really good food into a sensation that I haven’t had since the first time I experienced the luxuriance of a Turkish Bath. It penetrates to the very core of one’s reptilian pleasure center. Trust me, you have not had a burger until you’ve tried our neighbor’s grass fed beef on an onion roll with melted Havarti and a thick slice of bacon from our pigs. The sensorial feast had me feeling like a helpless dog taking in a head rub, and the first time Lori, Nancy, and myself bit into those burgers we all went silent; but that is the quality of the meat one gets when something is pasture raised and fed on goats milk. We can’t wait to get our next batch of hogs in and to spoil them out on pasture and in our oak stands, where they will get plenty of acorn this fall. But I digress! The weather at the first market was hot, and we instantly learned that the day after market you can’t really plan to do anything because you are pretty useless. Market day is frenetic: loading coolers, cutting flowers, loading and unloading and then loading and unloading yet again the truck, setting up tents and tables, and then standing for about seven hours in the heat in a social setting takes it out of you. So Fridays this summer will be pretty quiet around here I suspect. 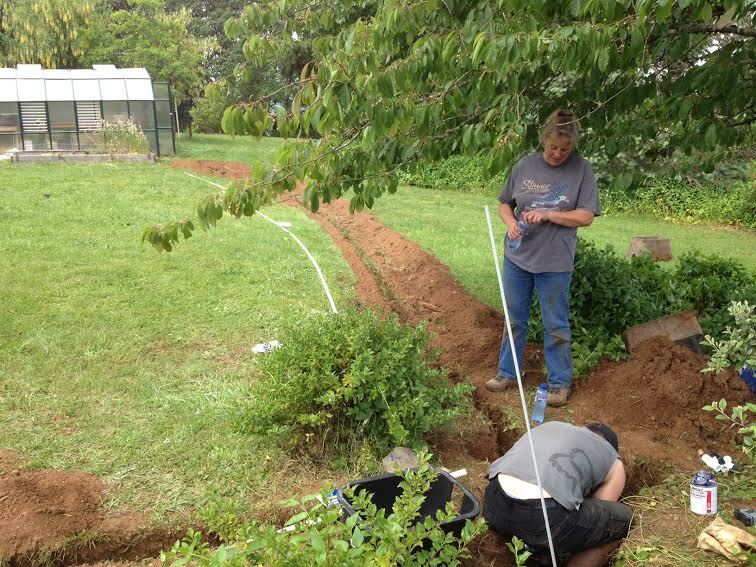 Our other big event was finally trenching about 1000 feet and laying down pipe for water. Our neighbors across the street, Greg and Bridget (who raise outstanding beef), were extraordinarily helpful getting it in, and in fact Greg ran the trencher the whole time, while Bridget laid much of the pipe. The rest of us did a lot of digging as Greg ran the trencher, to clean out the trench – I had never seen a trencher before, and it’s an amazing machine, like a chainsaw that simply digs in the earth to about, for us, 18 inches. 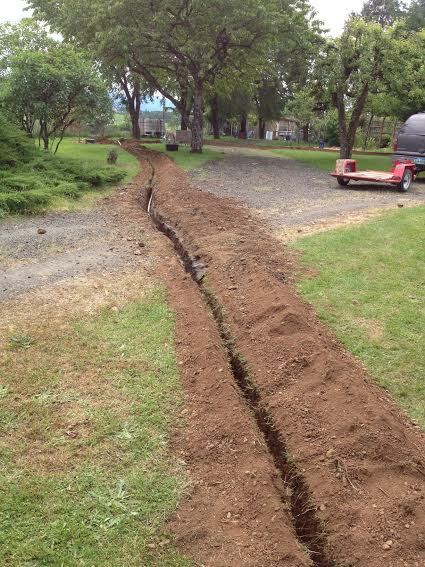 One of the trench lines running from the main to our garden. Back-filling was a day long task, and on the gravel road we had to use a tractor to do it. Bridget and Ryan work to repair my mishap with the main! Using a tractor to remove the box over the shut off valves: it seemed like a good idea at the time. 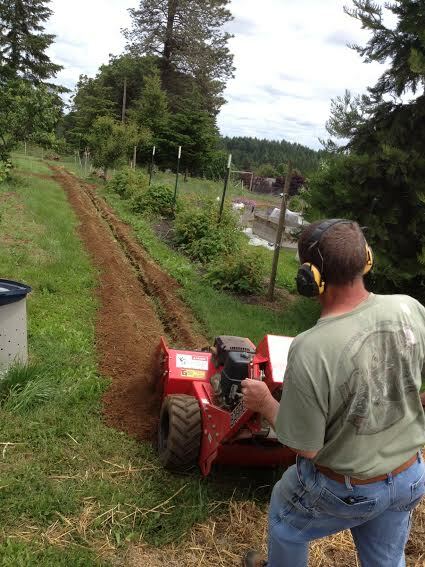 Greg works the trencher cutting an 18 inch ditch along the route of the tractor path in our garden. It made for two very long days, and in the process yours truly broke the main out by the road. We had to pull the box with the shut off valves out where the main was, and had a devil of a time doing it, so I hooked the tractor and a chain up to the box and started to pull; while the box was in no way attached to the main, the suction from the earth around it as it came out popped the main, so we had to shut it off and repair it. We started work that day with chores at 6 AM, got trenching by around 9, and did not finish until around 7 PM, so it made for a long Saturday. Thankfully we had the help of a young strong back to get us through some of the most difficult parts. 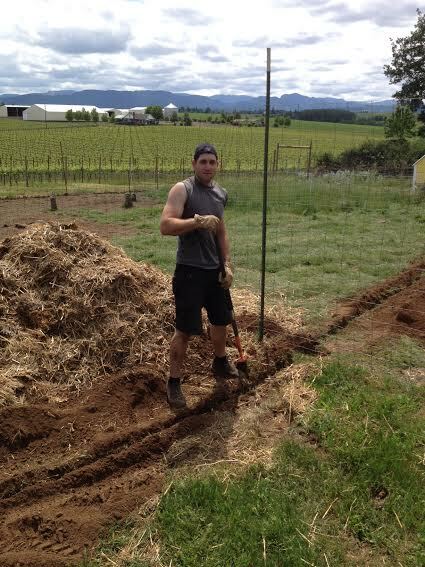 A gentleman from the local feed store, Ryan, who is a youthful and fit 23 year old, and who has been an enormous help on the farm this spring, helped us to dig under the fences where the trencher could not reach. In fact, Ryan has been instrumental in making us feel as though we have a handle on things this year, because he’s willing to work really hard physically and so has knocked out a great deal of tasks for us, such as clearing wood debris, mowing, filling raised beds with compost, digging raised beds, widening our driveway, and a host of other tasks that had been looming over us. If our farm looks beautiful, abundant, and organized these days, it’s due in no small part to him. In addition, he has an amazing amount of mechanical know-how under his belt that the three of us simply lack. Ryan has become an indispensable asset to our farm this spring; we only hope that we can keep finding young people of his ilk in future years to keep this place beautiful and running well! His help, and the trenching, now means that watering has become a great deal easier for us, and as a result I can do what I like and spend time tending the garden, rather than run around with a chicken like my head cut off. The confluence of his help and near perfect spring conditions means our gardens are as beautiful as they have ever been. We have been eating lots of greens from our garden for two weeks now that they have come in, and everything is as healthy and vigorous this year as it was meager and struggling last. For example, late last May I planted cannellini beans that never emerged. This year already not only have they emerged, they are going gangbusters – along with our chard, spinach, lettuce, cabbage, peas, potatoes, leeks, kale, sweet potatoes, tomatoes, squash, corn, melons, cucumbers, pumpkins, and strawberries – of which we are picking on average about 8-12 lbs every other day. 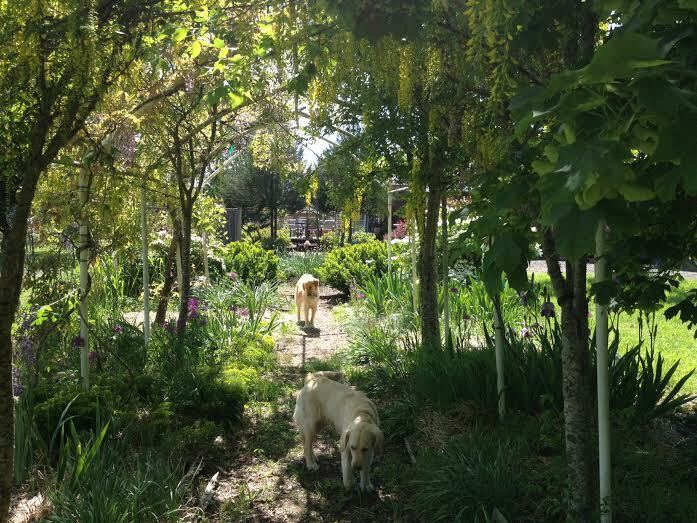 Jack and Puck take a stroll out of the afternoon sun under the shade of our chain trees. It has been about the most perfect spring weather imaginable, and our fruit trees are also doing very well, including, surprisingly, our Red Haven Peach, which has about 16 pieces of fruit on it as it enters its third summer. And thankfully, we have been able to enjoy it, put our feet up a bit, and smell some of our lovely roses. A beautiful spring day in the garden needs to be adorned with fine food and spirits, don’t you agree? I remember my first time in Italy in 1983. The first place I landed after three days of train travel from Spain was Florence. One of the strangest experiences I recall at the time was the bread. It was flat – no character or flavor at all. I dismissed it at the time as just bad food, an oversight by the baker, or some such thing. It was not until 1994, during my second trip to Italy, when I was spending time there as a graduate student, that I learned that it is a historical and cultural phenomenon: there is a tradition in Tuscany of not adding salt, or not much anyway, to the bread. Instead bread takes its flavor from other sources: dipped in olive oil, layered with cured meat, or, as I later found out, slathered with a slice of lardo. Lardo is salted lard, rendered pig fat that is then served up with assorted meats, cheeses and olives accompanied with bread. It is a treat I have enjoyed in Italy now on many occasions, and is a popular menu item in Florentine and Tuscan restaurants. We are now having a stab at making our own. On Friday I picked up several hundred pounds of pork raised and slaughtered on our own pasture. It is not until the slaughter and the harvesting of all that meat and fat that you realize why hogs have long been referred to as mortgage lifters on farms. I loaded up three coolers packed with ham, bacon, smoked hog jowl (to me it will always be known by the Italian term, guanciale), pork chops pork chops and more pork chops, shoulder steaks, ground pork, ground Italian sausage, and then threw in the back of the truck no less than three enormous plastic bags full of lard, and then, in another bag. the two heads for good measure (from which we will make head cheese). The ears and feet had long since been slow cooked and smoked on the grill and given to our dogs as treats. The pig is an amazing creature, and we love them, both as animals and as meat. I am happy to say that their harvesting went very well – one minute they are sunning themselves on pasture, the next moment they are gone. No stress of transport, no crowding into a processing facility: they died where they lived, and we are glad for that. We also stayed with them to the end, feeling an obligation to witness their deaths as an homage to their sacrifice. The gentleman who does the processing is a real pro named Kelly, and knows a great deal about the animal since he raises them himself. We would have never known, for example, about the existence of lace lard were it not for Kelly; it is a fatty membrane resembling lace that surrounds the internal organs of the animal, and you can wrap it around chicken, meat loaf, just about anything you roast, sauté or fry, and it adds both fat, flavor, and a natural basting – it is particularly good on lean cuts of meat and fish. Yesterday we had our first taste of the pork when I slow cooked the blade steaks on the grill. I brined them for 90 minutes and then slow cooked them with applewood smoke on the grill for about as long, also adding a rub and air drying them for about a half hour before putting them on the grill. Towards the end I glazed them with a homemade barbeque sauce, and they turned out quite well. This morning we had our first taste of bacon – the pieces were huge and the bacon, not surprisingly, the best I’ve ever had. To toot our own horn a bit, I would expect nothing less from our own pigs fed on pasture and given a steady diet of goats milk and an occasional beer. 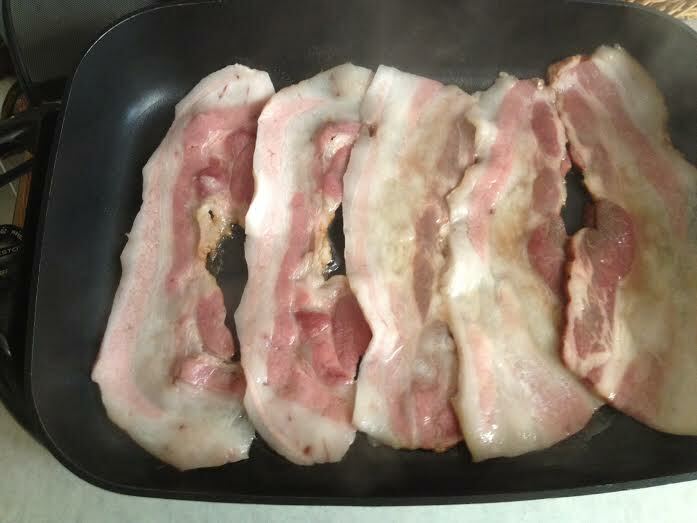 To give you an idea of the scale and size of the pieces, we can fit about 11-12 slices or so of thick sliced bacon from the store in our big electric skillet; this morning we fit in five. Bacon fed on goats milk and pasture and cured by an amazing local processor – and you thought the dog on that old television commercial was going nuts THEN! Tonight we are going to try the ham – nothing complicated, just wrapped in foil and heated; we will try some chard sautéed in guanciale as well. This morning I started to render our first batch of lard. 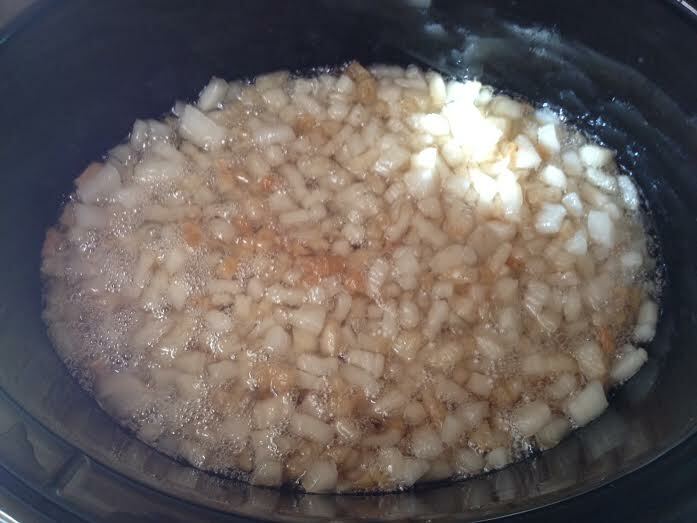 I removed some of the hog fat from a bag, cut it into small cubes, and put them in a crock pot at 5:30 this morning before heading out to do chores. Once the lard is rendered we will start to use that on toast instead of butter (well, except for the occasional goat butter); we will use it in pies and biscuits; and we will use it for the occasional fried chicken. If our numbers stay the steady course in our blood work from our doctors, we’ll start to use it as our only source of fat for cooking. Lard slowly cooks in a crock pot at 6:00 AM. I know what you are thinking: but do you want to live forever or do you want to live well? Bacon and lard was a standard ration of the Roman army, and when you see relief sculptures of the army about to perform sacrifice, the hogs they are leading to slaughter are enormous fat things with big lumpy shoulders, legs, and jowls. Sitting in the post-prandial haze of Sunday bacon, I wonder how ancient Roman bacon would stack up to ours. Consuming pig fat might eventually make me history; but eating pig fat, fare for the Romans, for Renaissance Florentines (or modern ones for that matter), is to partake of history itself. History might be boring to some: for me these days, it’s just plan yummy.